One of the things Maria and I enjoy the most about this mobile lifestyle is meeting up with friends on the road so we can explore a new city together. Usually this means meeting up with fellow RVers, but you don’t have to live in an RV to be mobile. Oh Beautiful Beer: Celebrating great design in the beer industry. Our friend Harvey from Oh Beautiful Beer manages to get around as well. His wife Leah is a mobile nurse and thus ends up moving to a new city every 3 months or so. The last time we saw these two beer fans was this summer in Green Bay, WI. We knew they were moving to Texas next and looked forward to being able to meet up again and explore the beer scene. Our wish was granted when he informed us that they were heading to Austin for the weekend for his birthday with is brother and friends! Maria had already set up a tour at Austin Beerworks for the Saturday they were coming and convinced the brewery into adding our guests to the list. Harvey was excited because he actually posted the branding for ABW on his website right around the time that they were opening up shop 9 months ago. ABW’s branding was done by the talented Helms Workshop and as designer’s we loved every aspect of it…including the beer. Austin Beerworks founder, Adam, discusses beer with Maria and Harvey. Due to Texas law production breweries can’t sell their beer on premise and thus have to give away any beer they serve for free. It’s common for them to give you three tickets and a small dixie cup for samplers. However the savvy consumer will buy one of their pint glasses that can be filled instead of the sample cups thus giving the patron a sizable increase in value. The whole group was able to try all their flagship beers: Fire Eagle American IPA, Pearl Snap Pils, Peace Maker Extra Pale Ale, and Black Thunder, a Schwartz beer, whose name was partially inspired by the movie Black Dynamite (Maria loves this movie). I loved every beer I tasted and we were able to talk to all the ABW founder’s (Adam, Will, Mike, and Michael) and learned about what inspires them to make great beer. We had a great time and learned what sound a Fire Eagle makes. The next day the Oh Beautiful Beer crew met up with us at, Hops & Grain Brewing, another new brewery that was literally a week away from starting it’s canning line when we visited. It’s a small operation now, but makes some great beer. Along with our free samples we got a tour the facilities and had an extended talk with Josh the head brewer and co-founder. Josh is the head brewer and co-founder of Hops & Grains. Josh had previously worked at Mountain Sun Brewing in Boulder, CO which happens to be one our favorite breweries. Along with Colorado’s love of beers he also brought it’s sustainable business ideals to Austin when founding H&G. They have many initiatives to ensure that they are being socially and environmentally responsible while creating great tasty beverages. Along with using their spent grain to make dog treats he also features a transportation incentive to employees (just one) that rewards them for using alternative transportation to get to work. Currently they have two flagship beers, but feature a “green house” system that allows them to experiment with new flavors on a scale that allows for kegs to be featured at several local bars and tap houses. My favorite was the Pale Dog pale ale which I enjoyed while Harvey, Maria, and I geeked out discussing H&G’s branding…great logo and great style. Unfortunately all good things must come to an end and Harvey and friends had a 5 hour drive to get back to Livingston, TX but knew we would meet up again someday as Leah’s next stop is expected to be Florida. Can you say “collison course”? 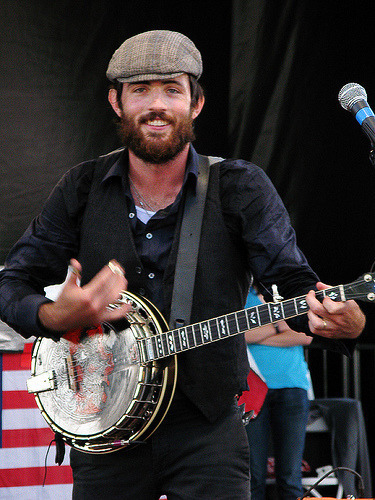 Little known fact: Josh from Hops and Grain and Scott Avett are the same person.